Police in riot gear have closed down an Occupy protest in central Portland, in the US state of Oregon, arresting some 50 people. Facing a Sunday morning deadline to leave two fenced-off city centre parks, protesters scuffled with police and attempted to stay on the city streets. Reports said the numbers on the streets had begun to dwindle by Sunday evening. Authorities across the US are trying to close down encampments occupied by protesters for weeks. Police in Oakland, California, have repeated warnings that protesters there do not have the right to remain in a downtown plaza. The Occupy Oakland protest has been marred in recent weeks by repeated outbreaks of violence and a shooting incident. In Portland, police using loudspeakers warned that anyone who resisted orders to leave the parks and surrounding areas risked arrest and "may also be subject to chemical agents and impact weapons." Demonstrators chanted "We are a peaceful protest", "I don't see no riot here, take off your riot gear" and "The whole world is watching". The confrontation began peacefully, witnesses said, but there were confrontations and shouting as police in riot gear attempted to move people out of the squares. The mayor of Portland, Sam Adams, had ordered the camp to be shut down on the grounds that "crime, especially reported assaults, has increased in the area around the camps". On Sunday, the mayor defended his order to clear the park, saying it was his job to enforce the law and keep the peace. "This is not a game," Mr Adams said. One protest organiser told The Oregonian newspaper that the ethos of the camps would endure despite the shutdown. "The parks are gone, but the consciousness has not died," said Gina Ronning. "We have momentum, but we need to channel it." Officials said that one officer had suffered minor injuries when he was hit in the leg by a projectile. Police also moved in to evict protesters camping in the cities of Denver, Colorado, and Salt Lake City, Utah, on Saturday. Seventeen people were arrested in Denver, police said. 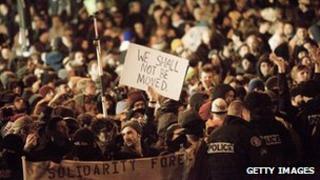 On Thursday, two fatal shootings took place at, or near, Occupy protest camps in US cities. A man was killed after a fight broke out close to the Occupy camp in Oakland, California, but it is not clear if he was a protester. In Burlington, Vermont, a 35-year-old war veteran apparently shot himself in the head in a tent at an Occupy camp. On Friday, a 42-year-old man was found dead inside his tent at an Occupy Salt Lake City protest in Utah. Officials believe he died from a combination of drugs and carbon monoxide poisoning. Occupy Wall Street is in its second month of protest against perceived corporate greed and economic inequality.